Your inner history buff will appreciate Temple of Dawn (Wat Arun) and Temple of the Emerald Buddha (Wat Phra Kaew). You'll explore and learn at Jim Thompson House and Bangkok Art & Culture Centre (BACC). 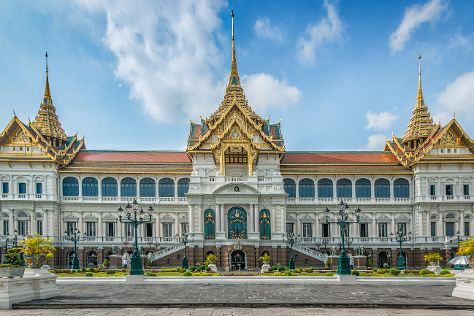 Change things up with these side-trips from Bangkok: Bang Saen Beach (in Chonburi), Ancient City (in Samut Prakan) and Dreamworld (in Thanyaburi). Spend the 5th (Fri) exploring nature at Dong Phayayen-Khao Yai Forest Complex. Spend the 13th (Sat) wandering through the wild on a nature and wildlife tour. There's lots more to do: soothe aching muscles at some of the top local wellness centers, browse the different shops at Siam Paragon, wander the streets of Khao San Road, and find something for the whole family at Safari World. To find photos, other places to visit, ratings, and more tourist information, read our Bangkok sightseeing planner. If you are flying in from Singapore, the closest major airports are Suvarnabhumi Airport and Don Mueang International Airport. In May, plan for daily highs up to 41°C, and evening lows to 32°C. Wrap up your sightseeing on the 13th (Sat) early enough to travel back home.